According to a Parks Department officer standing at the blocked-off entrance to Pier 2 on Wednesday afternoon, the pier was closed early after threats of “organized fights” among groups of kids. He said that it was possible that the pier would be closed for several days, though he hoped that it would be able to be re-opened on Thursday. 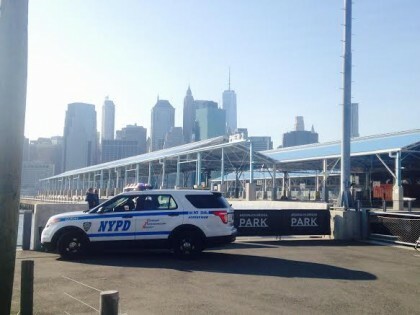 An NYPD officer said that it was the decision of the park, not the police department, to close the pier, and that the increased activity–organized theft and trouble near the park entrances–may be a result of schools being closed this week. The other piers remained open. Thank you to the police and parks department for their diligence. Keep this nonsense out of BBP. They should make all users of the facilities show ID and sign in. That would put an end to most of the shenanigans. Sound idea. Everyone can get a NYC i.d. card. Perhaps the BBP could liaise with the city to help kids apply. Anyone know if there are similar venues that require i.d.? Perhaps they should build a permanent guard station on that pier with round-the-clock security. It’s only going to become more of a problem as the weather warms up and when school is out. Glad to see Pier 2 closed yesterday but was a little nervous to walk through the park since the people that normally hang out there were wandering in groups throughout the park smoking weed. Pier 2 should probably no longer be basketball courts & the whole park needs increased police presence considering the types of people it seems to attract. I just moved to Joralemon street and thought it was a decent, safe neighborhood until i saw & heard the crowds walking down the sidewalks to the park from 3pm on. Now I have second thoughts about being out and about in the afternoon. Such a shame. Flash! Just walked the promenade and saw a young person at Pier 2 getting handcuffed by a policewoman. There were several other officers at the scene as well. As the police acknowledged yesterday, the vast majority of the people using all areas of the park are there to take advantage of a great facility. Asking for ID and closing the basketball courts–and only the basketball courts–seems like a pretty significant overreach. I walked through the park yesterday afternoon and yep, lots of people looking to play basketball were hanging out in other areas of the park, perfectly peacefully and amicably. How about cutting back on the basketball courts to no more than, say, two. There are plenty of courts within a 1/4 mile of the Park. As it is currently set up and over-lit late into the night it serves as what is politely referred to as an “attractive nuisance.” Those responsible for the park’s easily accessible and great open spaces need to pay attention to its design and to permanently provide complete security to the adjoining neighborhood. The priority goal should be peaceful enjoyment. If closing down some of access and its super attractions is called for well then so be it. On Monday evening, my friend and I witnessed a young man being jumped and beaten senseless by a group of kids near the picnic area by the Joralemon street entrance. We (and many others) called 911. After the police arrived and we continued on our way we noticed the basketball pier was closed. We asked a BBP employee why and they said it had gotten too crowded and fights were breaking out. So instead of monitoring the crowds as they left the pier, they just moved the crowds to other areas of the park, where the fights continued and a young man was terribly beaten. The park really needs to reconsider security. Walking (or driving) on Joralemon Street has become something of a challenge, especially between the hours of 7 PM and 9 PM. For the past several evenings, there has been some degree of police activity, evidently in response to crowds taking over the sidewalks and streets on their way to the train or beyond. It is not a good situation — either for residents or for BBP visitors. I’m so sorry you had to see this. No one should be subjected to this. But it makes it worse that people who simply wanted to enjoy a beautiful day in the park have to see something like this. I would love this. We had a shooting last year, and now we have public beatings and “planned fights”. Get this the hell out of here! Yes, that’s the way crime works. Not everyone is running around all the time committing crimes. It happens in small pockets at various times. We already had a shooting last year, and now people are being subjected to jumping until someone is beaten senseless. Who wants to bring their kids down there and have to worry about being subjected to this? As much as I love the Heights, Joralemon St. has gotten pretty chaotic in the summertime. My suggestion is to keep the windows shut and A/C on as much as possible if you can. Their carousing is generally of a harmless sort but it does get noisy at times. It’s all the Bernie/Hillary juveniles that ruin it for everyone. I bet if you eliminated the basketball courts and put a learning center or something academic related you’d have a different demographic. I agree that closing the b-ball courts seems extreme. But the Park leadership should seriously consider imposing some organization on the courts. Maybe bring in one or more leagues to establish a process for forming teams and playing. Our friends’ son went down to play one day and was told he couldn’t get into a game, no matter how long he waited, despite the fact that he’s an extraordinary athlete. It’s a bit lawless down there right now. If the BBP was run like an actual NYC city park, with park police patrols and regulation enforcement, would we be seeing so much bad behavior? Maybe it’s time for an organized task force review..
That’s a good point, and so disappointing. The NYPD officer I spoke with the other day sort of laughed when I asked who had closed the pier, suggesting that the NYPD had little jurisdiction in what is essentially a private park. That level of control is dismaying. The police have as much jurisdiction in BBP as anywhere else in the city. They can close off any public area if they deem there is a safety issue. Signing in to use the courts and having time limits if others are waiting is the easiest solution. True most who use the park are peaceful but there have been several incidents now, it will only continue or get worse, if nothing is done. The problem is and always has been the Pier 2 basketball courts. They attract a higher percentage of aggressive young men than do the other BBP destinations (the soccer field, or Pier One, for example). Pier 2 might be a Park problem rather than an NYPD problem. But to and from Pier 2 it’s an NYPD problem, and needs to be managed by the NYPD. The other alternative is to simply close the basketball courts. But that’s too extreme. Better to try tighter policing first. wow. not even trying to veil the racism. Oh, here we go. We can’t have a civil discussion about safety in our neighborhood without being called racist. Why don’t you contribute some solutions instead of name calling. What exactly do you see as racism? This is not about racism at all. It’s about our safety, fact, and statistics! I now wonder if Joralemon, or any of the Heights’ narrow streets, are appropriate entrance routes. Is it possible to close them, and for people to use Atlantic or Fulton only? As if Joralemon isn’t packed enough, it’s going to be inundated with Pier House residents fleeing the park deemed safe by their rat-bast@rd realtors. in that respect, why doesn’t the public garage put the “garage full” sign at the corner of Atlantic and Furman instead of at the garage entrance — which would alleviate the backups and increase traffic along the one way system? The NYPD and BBPC have become pros at pointing the finger at each other in terms of responsibility. When the park was still in the planning stage, there were many meetings in which Heights residents tried to persuade the “powers that were” NOT to build an entrance on Joralemon Street fearing their narrow street would be overrun.